Mystable is a fun online horse game! You have your own stable, and you can buy a horse then you can train it, enter shows, breed it, and care for it. It's definitely fun! Have you played it? Scroll down to read reviews, and be sure to share your review and tips with us! After you play, be sure to come back and share your review of My Stable! Share your tips and ask for help below! Can you ride the horsey you buy? I love this game! I have 2 horses, a filly called lemon and a Clydesdale. I love this site you have put up, all the games are awesome!! Well i think if you are on hoilday they should look after your horse!!!!!!!!!!!! Great online horse sim game! I LOVE MyStable! The only thing that I don't like is you have to have really high level horses to get money after you sell them. how do u play this game because it looks like a good game but u need to tell us how to play it? SHARE YOUR TIPS FOR PLAYING MYSTABLE! Are you good at the horse game MyStable? Share your tips, strategies or cheats for this game here. Just click on the comment link to add your tips. I think it sounds awesome and I have already tried signing up for it but I don't have an email address (sob) so I can't log in! DO YOU NEED HELP WITH MYSTABLE? SHARE YOUR REVIEW OF MYSTABLE! Tell us what you think of MyStable. Just use the comment link below to share your review. I H*** IT! It doesn't let me in, i'm put my right things but they won't let me in!!!! i haven't played it yet but it sound's like a really good game. It's the greatest game ever because it's a like a real horse. My brother even has a horse! Well this game is so complicated and I can't figure it out so please anybody, help me. My stable is so not fair cuz you have to be 13 or older to play! Who agrees? MyStable is a great game--not perfect but pretty close. 3 1/2 out of 5! I think it's a very cool game!!! MyStable is awesome because I have made a friend who lives in London and won more horses!!! Now I have 5 horses I LOVE THIS GAME!!!!!!!!!!!!!!!!!! I think MyStable is about taking care of a horse like what you do on a farm..
MyStables is a great game and good for learn things about horses. I like MyStable a bit.. But I think they could still make it better..
My Stable is a great game! I think my stable sounds cool i love horses that's why i think it sounds cool! i could not log in!!!!!!!!!!! same as what... wast of time!!! heya everyone 2 be honest this isn't one of my most fav games but anyway does anyone no any games that r better than this? I think is the best game ever! MyStable is so much fun! nothing else can be good as MY STABLE!!!!!!!!! i think it is an awesome game! It looks good and I love horse! I love it. It is a special place for me to be. lovely niceand it is my dream to seea stable . Can't think of any cheats but deff a must try!!!! It's totally cool and nice! Erm, do you have Pony Luv online??? love it. Mystable is great! i think mystable is going to be a fun game. me well i think its awesome i love it i just don't know what to say it's just fabulous!!!!!!!! I don't really like it. I can't log in. Help please! It stinks! I can't even login! Howrse is WAY better!!!!!! MyStable ought not even to be on here!!! Sorry,but it doesn't even load!!!!!!! Please Change it!!!!!!!!!!!!!!!!!!!!!!! I think MyStable is the best game I've ever played! I have just started this games and i love it!!! Its one of the greatest virtual horse games ever!! I LOVE MYSTABLE....IT IS SO MUCH FUN! I love my stable because of all the wonderful people and horses! I like Mystable because it is cool and ensternzing. Its Brilliant I mean a whole website just for girls who like Horses I mean WOW! i love mystable i go on everyday i cant stop! the most awesome game ever. i could repeat that many times. many times. many times. many times. told ya!! I just got registered but so far i am having a load of fun. Ok so I'm a big fan of mystable and I'm biging big on it and you should come see my stable! The names, Lone_Dove. I think MyStable is awsome! I CAN NEVER GET LOGGED ON!!!!!!!!!!!!!!!!!!!!! It was fun and cool to go on. i told my mates about it and they say it was cool as well! ok well i've never heard of it! i thiink it is awesome! I think it is brill. How do you get a horse. I think it is brill. I have always always wanted but my parents couldn't afford one so now I van have a vertiual on. Super COOL!! so we don't get to play it. my only horse at home is more fun. It has my horse tadpole. She that look great and a gencher. it is great and I love it. It is perfect for the horses. i dont think that its any good. It seems like an awesome site!!!!!!!!!!!!!!!!!!!!!! its awsome also look at this http://www.mystable.co.uk/ then look at my stable! it is very good but i have not seen it yet. well i think it was stupid cas like it would not let me play i joined like it said but it still would not let me play. It is so boring. I don't even understand it! I don't like it. It not fun at all and it is hard to figure out. I shouldn't have tried it. me and my friend TimeLord love it!my username is Arealie! get a horse from me! i think of My stable is really cool iv always wanted a horse. !!!!!! YOU HAD TO LOGIN AND STUFF AND WHEN I DID IT, IT WOULDN'T LET ME PLAY THE GAME!!!!!!!!!!!!!!!!!!!!!!!!!!!0!!!!!!!!!!!!!!!!!! The only non realistic things are the pictures of the horses, and that the feed costs like 100 points. IT WAS SO COOL BECAUSE I LOVE MY HORSE BELLA SHE IS LIKE THE BETS HORSE IN THE WORLD!!!!!!!!!!!!!!!!!!!!!!!!!!!!!!!!!!! what i think of my stable is it is great has stalls, padocks, cool out area, riding rings, jumping rings, wash rack, and grooming tie ups. my stable rules i ¢¾ it! one of the best horse games ive ever played 5 stars!!!!!!!! I just love playing mystable because i love horses. THEY ARE SO COOL. AND ALSOME. Don't know... i never go to play it yet. it was rellay fun and the horses are the best part. Very cool. I already have 3 horses on the game!!!! this game sounds very fun and exciting i love it . i made an account and tried to get in but it would not work. i love mystable it is so different to other games and i am looking forward to playing it. do u have 2 be a member 2 play? great and good to plaY YER !!!!!!!!!!!!!!!!!!! Well its a fun game but only for a bit. It gets boring quickly. IT is like Howrse. I think its a great game!!! I totally love horses! I take weekly lessons. MyStables helps me meet new horsey people. I think it wold be better without the email bit at the registering part. I have played on mystable, and its brilliant! I love it all! 10/10! i think it is really fun to play, but i didn't play it yet. I THINK THAT MY STABLES IS THE BEST GAMES IN THE UNIVERSE!!!!!!!!!!!!!!!!!!!!!!!!!!!!!!!!!!!! i love horses alot and i cant aford one or board this is a good way to know what its like to own a horse! i think it is very fun and creative. IT IS AWESOME, BUT IT NEEDS TO BE MORE REALISTIC! Difficult And A Bit Boring. i like it alot. I like how you can breed the horses. This is the best horse game ever!! Well it is pretty good but quite confusing!!! I trying to get on it but it won't let me. I'm going to try until it works it sounds awesome. i love ponies. I think this a bad game,because you have to open your account and you don't know how,and what your mom's password is. This game is very cool highly recommended. i like my stable and will definitely keep on it! i would recommend it to ANY horselover! My stable is a fantastic experience that whisks you off your feet to an unbelievable world! i think it is not very good i can not play it! it will not let me play and i want to so what can i do about this?? I hope to really enjoy this game! i think its a great site.! I think it is excellent i think it's really easy to use and i enjoy it. My stables is for anyone that loves horses and anyone that wants to learn how to ride horses! well I will have varieties of horses at my stables!!! I like it - it's a fun game! it really kool i was he first ever person to be on it im not joking thats why i got a golden pass coz i was the first person ever loolololool. I Was Really Excited Too Try Out The Game But When I Was Tryin Too Type In My Password It Kept Saying My *= Date Was Required What Does That Mean ? I think mystable is cool. It seems fun too. i really don't like it to be honest it is very very boring!!!! I think it's really great. The MyStable.co.uk rocks! Take care of your horse feed,brush,etc. You have to train your horse to get better, but it's a lot of fun. I Think Its A Really Fun Game And i Always Play on It,.! Have you ever tried breeding kiger mustangs? The foals are SO SMALL and CUTE!!! I just started but i love it already! The best game in the world!!!!!!!! 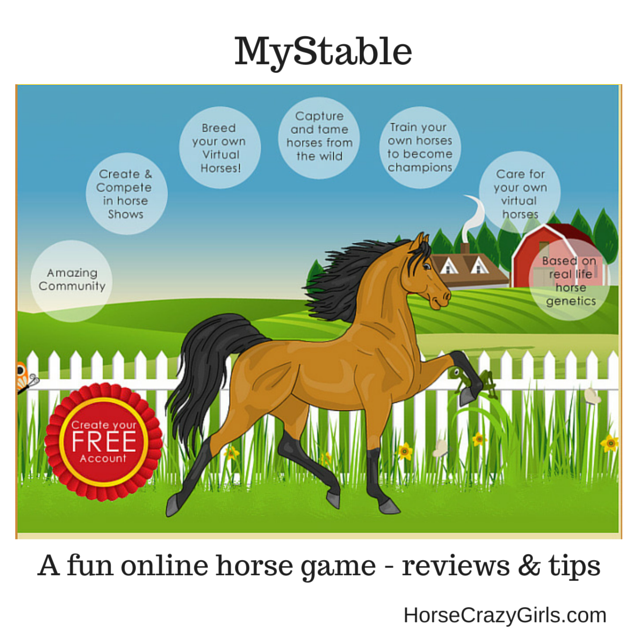 MyStable is a terrific game for horse lovers! I'm crazy about MyStable! I think it would be good if it actually worked!!!!!!!!!! I don't know how to get started. do you? From:kimi To:you bye! Never played it but still sounds really fun, I LOVE animals! I think it is a great game for people who want horses when there older because it teaches you how to take care of that great animal. I have not played it yet but I am really excited! I think it will be a great game. JUST KIDDING! I already have my own horse, and account! I luv it alot and think any1 who tried it will luv it alot. I haven't been on it yet but i like howrse lots. I think its very nice. This is a great game! It's so much fun to play! I LOVE MYSTABLE! I like it a lot I think its really cool. It wouldn't let me log on. Great game! Awesome and fun but unfortunately a lot of poor lined horses on there, and training is a little slow but hey IT'S AWESOME!!!!!!!!! It's really good love it! Okay...but it gets EXTREMELY BORING VERY EASILY. This is by far the best horse website ever!!!!!!!!!!!!!!! It's very good for horses. It's awesome. I love it!!!! It is VERY FUN! I reccomend plaing the game every day! I haven't played yet but I think it will be great. I will love this game. It rocks...can I play it again? Well it looks really cool. Wow...I LOVED IT!! !It was sooooooo much fun!!! It is fun and awesome. You do everything with a horse. I think Mystable is the best game I have ever played in my life. Star light is a stable for girls and boys. it is a big stable so that a girl and boy can live together in it and have a foal. FROM what i`ve heard its a very cool game. You get to own your own stable and horses!!!!! !I`ve signed up and i think you should to. Find more fun horse games for horsecrazy girls!